Longtime, experienced cruisers found just what they were looking for in this single-engine cruiser. 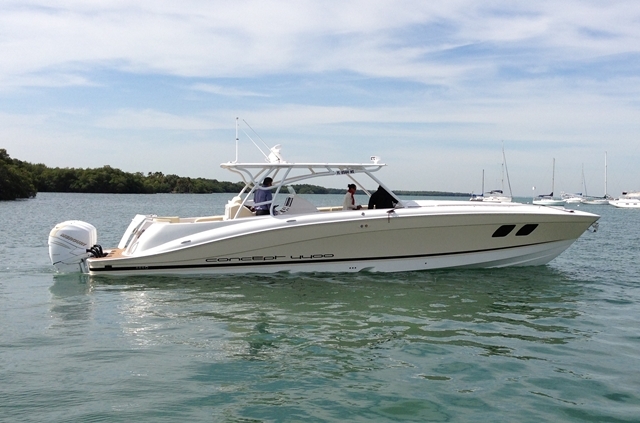 Charles and Marjie Gentry went to the 2008 Miami International Boat Show looking for a powerboat, something around 34 feet with a traditional feel. And just a few more things. It had to fit in their condo slip at Marco Island, Fla., as well as on a flatbed trailer for transport to Maryland for a passage to the Great Lakes. It would be required to handle equally well the “thin water” of western Florida, with its notorious crab pots, and the tempestuous deeps of the Great Lakes. 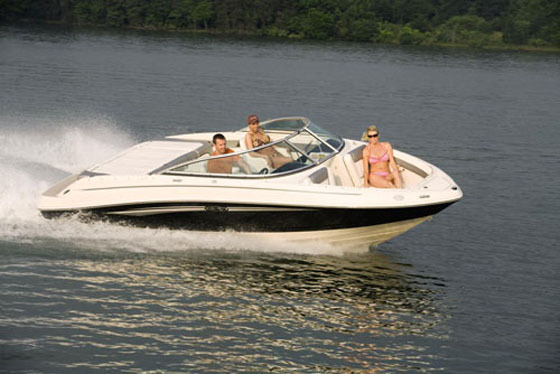 And, last but not least, the boat’s comforts and conveniences, as well as the seakeeping and handling, would have to satisfy a pair of longtime, experienced cruisers. The flared bow keeps the boat dry in all but really heavy weather. The Gentrys paid around $400,000 for the boat through North Point Yacht Sales in Annapolis, Md. In May 2008, “We became the proud owners of Blue Chip,” Gentry says. 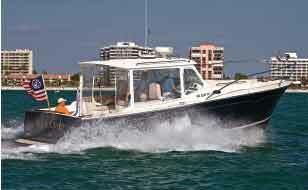 The 34z rides well, too, and that’s important when a cruising couple has to deal with all kinds of sea conditions. “The pronounced bow flare provides a dry ride in all but really heavy weather,” says Gentry. The cabin layout includes a fully equipped galley and dining table/V-berth area forward with seating for six. There’s a compact enclosed head compartment to starboard. Blue Chip’s Florida itinerary calls for a lot of day cruising with friends, and it can handle six to eight people easily. “Many boats emphasize cabin space at the expense of an open deck, but not Blue Chip,” says Gentry. “It’s perfect for group picnics [and] sunset cruises, and yet a full set of privacy curtains can quickly turn the bridge deck into an upper-level cabin with guest sleeping accommodations.” They also see the boat as a long-distance cruiser and are taking Blue Chip on a passage from Chesapeake Bay to the Great Lakes this summer. 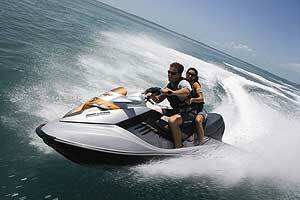 A single 440-hp Yanmar diesel will help get them there. And thanks to the boat’s lightweight construction, the Gentrys expect to get around 2 nautical miles per gallon at a cruising speed of roughly 22 to 24 mph. The 34-footer has a 3-kW Westerbeke generator for the reverse cycle air conditioning/heat, and electronics include a Raymarine navigation system with radar, a VHF base station and full-function handset, and a Raymarine hydraulic autopilot. The ability to truck the boat easily was a big “plus,” says Gentry. “It allows the boat to be used around the Great Lakes during summer and Florida in the winter without struggling through a long, tedious delivery trip,” he says. “Preparing for shipment is easy. Lower the antenna, remove the anchor light, and store cushions and canvas in the cabin.” All in all, it was a good buy, the right boat at the right time, says Gentry. “With the exception of her handsome appearance, great handling characteristics, complete navigation electronics, unbeatable fuel economy, beautifully equipped and finished cabin accommodations, heavy-duty deck hardware and top-of-the-line Stidd recliner piloting chairs, I can’t seem to think of anything good to say.” That says it all. 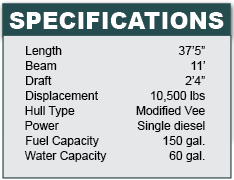 The mJm 34z rides a modified-vee hull with 18 degrees of transom deadrise and a sharp entry carried well aft, with a full-length chine and a series of lifting strakes. The bow is tall and moderately flared for a dry ride. The chines and keel are solid fiberglass. Vacuum-bagged Kevlar and Core-Cell foam with epoxy resin is used in varying thicknesses for the hull and bulkheads, with Baltek coring used for the decks. The result is a lightweight boat the builder says gets about 2 nmpg at cruising speed. 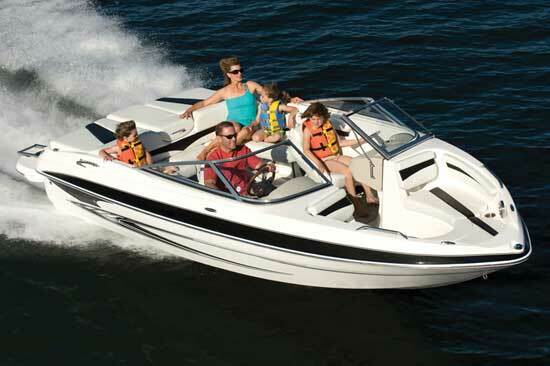 The Downeast model has an extended hardtop with weather wings/side curtains that protect the helm station and companion pedestal seat. 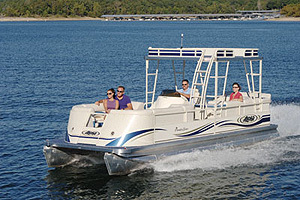 The pilot sits to starboard behind a curved, three-panel windscreen and a molded fiberglass console with destroyer wheel. The single engine is mounted below the wheelhouse sole. Down below, the cabin layout starts with a galley near the companionway to port, with stove/oven, refrigerator and hot/cold pressure water. The dinette forward seats six and converts to a berth for two. The enclosed head compartment, to starboard, is compact and comes equipped with a VacuFlush head and a shower. 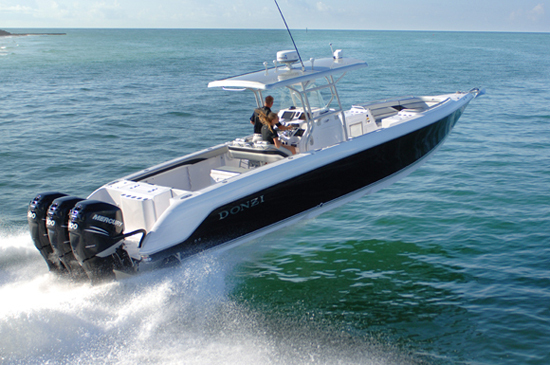 The mJm 34z can be found from coast-to-coast on the used-boat market, with prices running from around $350,000 to $400,000. Steve Knauth is a contributing writer for Soundings Magazine, where this article was originally published.